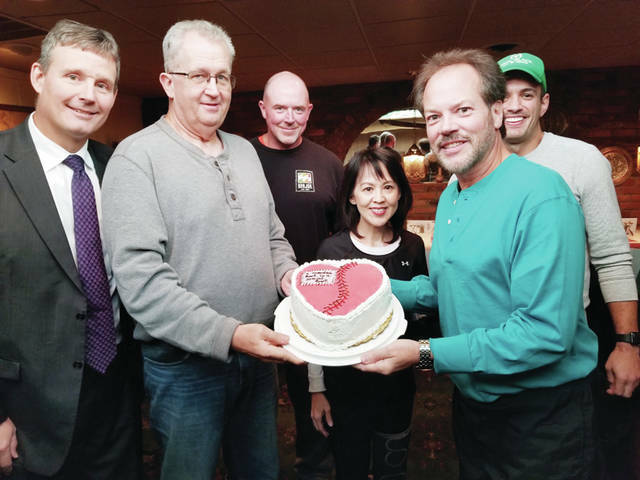 Jeff Wilson, center right, and Dave Rice, center left, hold a cake presented to Wilson during a lunch celebration at Byblos Restaurant following his recovery from a massive heart attack. Wilson credits Rice and fellow pickleball players with saving his life. Also pictured, from left, are Dr. Greg Haselhuhn, Fred Borgerson, Phuc Lee, and Wyatt Yoder. Dave Rice said he was just in the right place at the right time. Jeff Wilson, the man Rice played a pivotal role in saving from possible death, disagrees. “I’ve been told by a good dozen health care professionals that the CPR compressions done so quickly and well kept me from dying or from permanent disability,” Wilson said. The 55-year-old self-employed Sylvania Township resident is still recovering from a massive cardiac arrest he suffered while playing pickleball the evening of Oct. 9. He said if it weren’t for Rice and a group of others who responded quickly when he collapsed, it’s possible he wouldn’t be present to tell the tale. As part of an advanced pickleball group – the paddle sport combines parts of table tennis, tennis, and badminton – Wilson was playing doubles, with Rice as his partner, at Strawberry Acres Park in Holland, Ohio. Wilson was planning to leave for an appointment after that particular match, which was taking longer than is usual. “I picked up the ball, and the whole world spun sideways real quick, and I felt myself going down,” he said. Rice, a Sylvania Township resident and an employee of North Star Bluescope Steel in Delta, had noticed earlier that Wilson didn’t look well, and tried to steady him before he fell. “He looked like he was having a seizure. He was conscious but unresponsive,” Rice said. Dr. Greg Haselhuhn, who was competing against Wilson and Rice, and Becky Chen, a nurse visiting a player on a nearby court, rushed to Wilson’s side. As they monitored his heart rate and respiration, Wilson, now in full cardiac arrest, stopped breathing and began turning blue. Rice, who was on one side of Wilson, immediately began performing CPR while the doctor and nurse continued monitoring Wilson’s vitals. Though Rice had learned CPR in the military decades before, and had refreshed his skills five years ago through a voluntary class provided by North Star, it was his first time actually performing the procedure. He continued CPR on Wilson for the next five minutes, until a Holland police officer arrived and took over. An EMS crew then revived Wilson after administering two shocks from an automated external defibrillator (AED). “I don’t remember anything until the paddles brought me back the second time, about eight to 10 minutes later,” Wilson said. He credits fellow pickleball players with dialing 9-1-1 and placing a reassuring call to his wife, Beth, during the ordeal. He especially credits Rice for acting so quickly on his behalf. “They knew Dave’s compressions were doing the trick…until they could get the EMTs there,” he said. On Oct. 12, he successfully underwent double bypass heart surgery. He was released four days later, and returned to light work at his home office a week later. After a long convalescence, he began cardiac rehabilitation this week. While in the hospital, he texted with Rice and others who had helped him. “You can’t thank somebody enough for something like that. It’s just the most thanks you can give,” he said. About three weeks ago, the small contingent of players at the park that day surprised Wilson with a celebration at Byblos, a Lebanese-Italian restaurant in Toledo. Wilson said there were no warning signs of his impending heart attack. He said Pickleball is a sport popular with older participants, so afterward many of his fellow players expressed shock that he was the victim. Rice shrugs off the “hero” label he’s been given. “If I wore a cape, maybe,” he joked.